Hello Friends, Today I’m coming with an exciting and saving offer. Just from facebook messenger, you will earn 50rs per referral. This trick is for educational purpose only. HDFC ONCHAT 50RS REFER TRICK is available for all users. Just you have to sign up using mobile number and boom, You will get 50rs. This amount which earned by referring can be used for electricity, recharge, or any other platforms accepted by HDFC ONCHAT team. This money cannot be transferred to the bank but can be used 100%. First, you have to download the facebook messenger from PlayStore. Click here to download the messenger app. Now sign up or login to your fb account. Then click here for 50rs refer amount. After clicking above link HDFC ONCHAT page will appear in messenger. Send mobile number to that page. Enter OTP and complete sign up procedure. Send messege as ‘refer’ to this page. You will get a referral link to your mobile number. Whenever your friend will sign up you will get 50rs per refer. You will get 50rs per refer. You can earn maximum until the reaches limit. This offer can be stopped without prior notice. You cannot promote links on adsense. Referral amount can be only used to spend this money on available platforms provided by HDFC ONCHAT app. 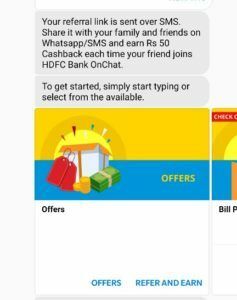 HDFC ONCHAT is an ai application runs on messenger. Just in simple words it works according to the input by user. This app is designed for recharge, bill payment and other purposes like movie ticket booking. This company is powered by HDFC group. Hii, what is maximum amount can be earned from that ?